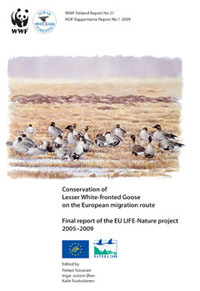 The Fennoscandian lesser white-fronted geese have been the fortunate subjects of several EU Life projects. The programs have by themselves and through efficient collaboration by stake holders led to significant improvements for the Fennoscandian Lesser White-fronted Goose. By 2012 the negative trend seems to have stopped, with a positive increase in the Fennoscandian population since 2010. Below is a list of accomplished and ngoing EU Life projects with links to final reports or web sites for those ongoing. Reports or litterature from the various EU Life projects can be found through literature search with key word "EU-Life »". The main focus of the project is in wintering and staging grounds of the population in south-eastern Europe. The project is implementing the recommendations of the International Single Species Action Plan for the species, and it is a direct follow-up project of the previous LIFE project “Conservation of the LWfG on the European migration route” in 2005-2009. In order to succeed in the conservation of the LWfG, efforts require a flyway approach. Thus, the project involves eight partner organisations from four European countries along the flyway. The multi-national and multi-institutional partnership plays a key role in the project. The project will undertake concrete actions in seven NATURA 2000 sites in Greece, Bulgaria and Hungary. The present EU Life+ project is coordinated by the Hellenic Ornithological Society, from 2011 to 2016, in collaboration with the Forest Research Institute of the National Agricultural Research Foundation - Greece, the Ministry of Environment, Energy and Climate Change - Greece, the Bulgarian Society for the Protection of Birds (BSPB), the Hortobágy National Park Directorate - Hungary, UNEP/ African - Eurasian Migratory Waterbird Agreement Secretariat (AEWA), WWF Finland and the Natural Heritage Services of Metsähallitus - Finland, with the financial support of the European Commission and the co-financing of the Directorate of Nature management (Norway). Follow the EU-Life project on Facebook! The ultimate objective of the LWfG Life project was to stop the decline of the Fennoscandian population. The most important negative factor causing the population decline is hunting and poaching. The LWfG resembles very much the White-fronted Goose A. albifrons that is an important quarry species in most countries within the range of LWfG. Thus, in practice the only effective way to protect LWfG is to ban hunting of all white-fronted geese in the periods when LWfG are present at the very limited key sites. Conservation actions in the already known key sites need to be implemented urgently, and there is also an urgent need to uncover the still unrevealed sites along the flyway. The main actions of the Life project were satellite tracking and colour ringing of LWfG to map the key sites; preparation of national Action Plans for the species in Norway, Finland and Estonia; habitat restoration and management to keep LWfG in safe and favourable sites in Estonia and Hungary; and public awareness campaigns, most of all for hunters and farmers in the key areas, to reduce the risk for LWfG of being shot. The Life project involved ten partner organizations in Norway, Finland, Estonia, Hungary and Greece, i.e. in all countries with known important sites along the European flyway, except for Russia. In Russia, the Fennoscandian LWfG population has an important autumn staging site in the north-western part of the Kanin Peninsula, and the Life project was eventually able to organize conservation-oriented field work also there. Other countries along the complicated migration routes of the Fennoscandian LWfG population like Lithuania, Poland, Bulgaria, Turkey, Ukraine and Kazakhstan were not included in the project either because no specific sites for the species were known, or because the Life-Nature was not a feasible funding instrument for the country in question. In 2001, a program aiming to restore the Drana Lagoon, a key habitat of the Evros Delta, was launched with European Union support. Among the expected outputs was an improvement of the conservation status of the rare goose by wardening the area and an enhancement of the quality and surface of natural habitats used for roosting and grazing. Two objectives were followed. 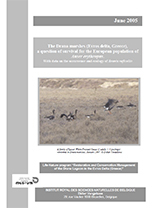 First, to evaluate the effect of Drana Lagoon restoration on wintering Lesser White-fronted Geese in order to determine which further actions could improve their survival and eventually increase the capacity of the area. Second, to collect ecological data on the Lesser Whitefronted Geese wintering in Greece in order to participate in the global effort aiming to understand why the species is declining. Could their appartenance to a particular breeding population be traced? Which are the demographic parameters? The objectives and activities of the Life project were based on the experience of the Finnish WWF LWfG working group and international co-operation partners as well as on the international Action Plan for the LWfG (Madsen 1996). Although, according to the rules of Life funds, only 10% of the funding may be used outside the EU, the idea was not to restrict the scope of the project to a Finnish or a Fennoscandian scale. The strategic idea was to promote LWfG conservation especially along the migration routes and in the wintering quarters of the Fennoscandian population and the western part of the Russian breeding population. This was possible, because of the advantageous ratio between the western and eastern exchange quotations. Thus the 10% of the resources spent outside EU could form significantly more than 10% of the results. 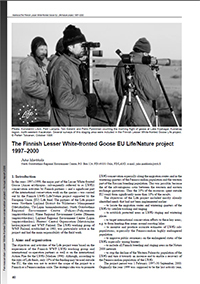 The objectives of the Life project included mostly already identified needs that had not been implemented earlier:  to locate the migration routes and wintering quarters of the LWfG by satellite tracking and ringing  to establish protected areas in LWfG staging and wintering places  to target international conservation efforts to these key areas; 1) to form hunting-free zones around roosting lakes. 2) to monitor and produce accurate estimates of LWfG subpopulations, especially for the Fennoscandian highly endangered population. 3) to improve public awareness on the endangered status of the LWfG, especially among hunters. 4) to include all Finnish breeding and staging areas in the Natura2000 network. 5) to stop the decline of the Western Palearctic population and turn it towards an increase and to enable a recovery of the Fennoscandian population of the LWfG. The project period was 1 February 1997 to 2000. Originally the year 1999 was suppose to be the last activity year, but the delay in establishing a protected area at Säärenperä on the Bothnian Bay coast, allowed us to apply for a continuation of the project time. The Life project was led by a team consisting of representatives of partner organisations. The team carried through 15 project meetings and altogether 114 people participated in the work, ca 60 as volunteers and ca 30 as temporary employees. Most of the employment periods were short, 15 months, but four were lasting 18 months or more.